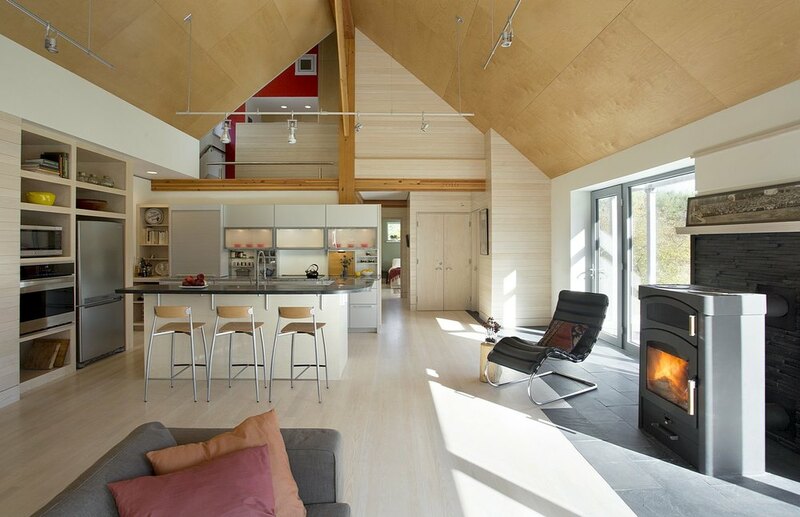 As a Certified Passive House, the Farmstead is a forward-thinking home for the modern New England family. DESIGN CHALLENGE. 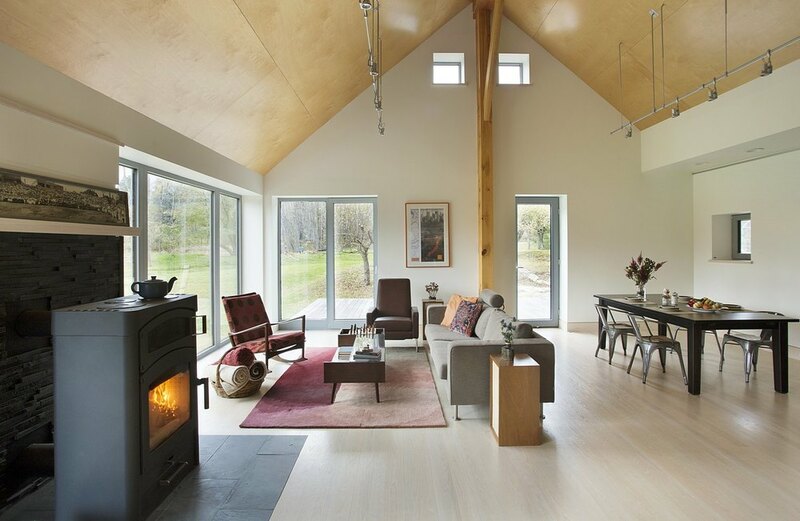 A blend of features were carefully balanced to develop a final design that has an efficient footprint, meets the Passive House Standard (PHIUS+ Certified), and takes the form of a traditional farmhouse with some modern twists both inside and out. Durability was also a top client priority – this influenced a lot of the exterior design and detailing. SITE AND SURROUNDINGS. This 200 year old, 100-acre farmstead is predominately held under conservation restriction by the Upper Valley Land Trust. 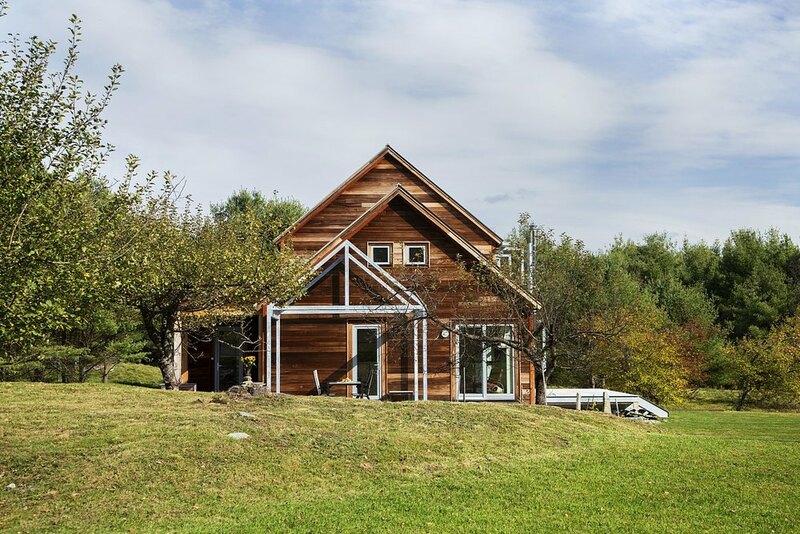 While the home sits in a field, it was sited behind a rise in the terrain that plays host to several fruit trees. CLIENT REQUIREMENTS. The exterior form complements the nature of the Colonial era site and the town history, with gabled roof lines. The exterior detailing – the siding, trim and steel decks – give the traditional form a modern twist. A progressive, contemporary look completes the interior, offering a clean, fresh modern feel. The client requested a structure on the south side of the house that would permit vegetation to grow and could double as summertime shading. In the walk-out basement, a freezer door provides access to a root cellar for energy-free food storage. CONSTRUCTION. 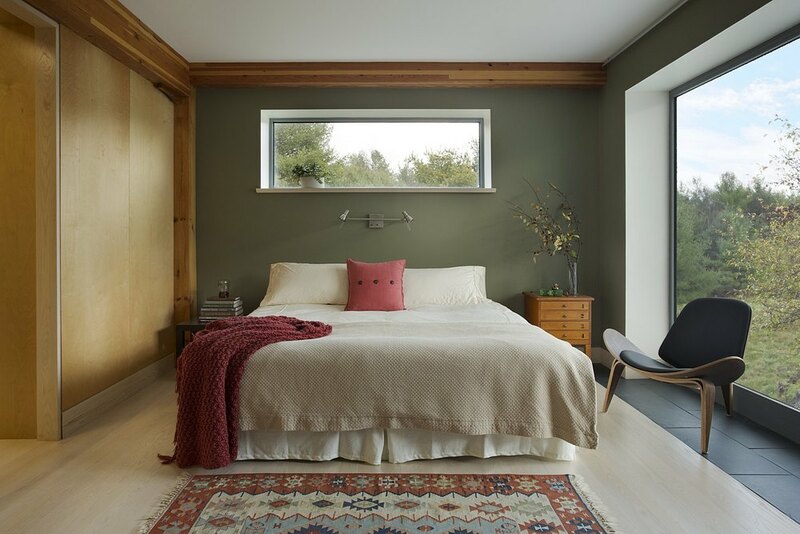 After building the super insulated foundation on site, the home's walls were constructed inside a factory where it was protected from the elements and yielded very low levels of construction waste. The prefabricated structure was then trucked to the site, lifted by crane, and quickly assembled weather tight, which minimized the interior's exposure to the elements and mitigated the risk of water damage and mold growth.